Imprint Method: UNIMPRINTED - Choose style and sophistication with our Rosewood Humidor. This cigar humidor keeps your cigars fresh in style with this piano finish humidor. This item has a built-in hygrometer and humidifier. Add your logo to this polished product to create a gift full of class. 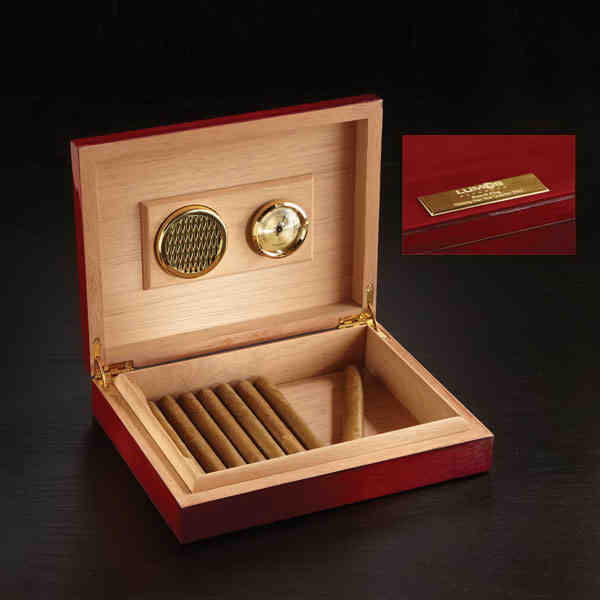 With a Spanish cedar interior, this elegant box makes a lovely gift for the cigar connoisseur within the company. What a wonderful addition to corporate anniversary dinners. Size: 2 " x 9.88 " x 7.19 "
Imprint Size:3.25" x 0.6875", 3" x 0.75"